Dolls, in the left corner we have Chloe’s ultra-covetable Zippier and Buckle Boots – the very same ones you have seen styling the tantalizing tootsies of Miley Cyrus, Mischa Barton, and The Hills’ own Stephanie Pratt; in the right corner we have Miranda by Yoki’s Strappy Buckle Booties. While there’s no denying that the gold hardware decorating the marvelous Miranda by Yoki version creates a slightly different look than that seen upon the chic Chloe’s; for just $39.98, in comparison to the $1,175.00 required to call the magnificent Zipper and Buckle Boots your own, they are every bit as capable of bringing out your rebellious side – at a price fit for a frugalista! Thanks to The Fashion Row and Love My Shoes for the pictures. Don't forget to enter the In the Navy Giveaway for your chance to win a Hermes Birkin-inspired Diana Satchel in Navy from Mimi Boutique. Don't forget to enter the Forward March! Giveaway for your chance to win a Rothco Heavyweight Classic Messenger Bag in the color of your choice from ClothesOutSale. I love strappy boots so much! Definitely love the Chloe ones, but the Yoki ones are more in my price range. I actually prefer the Yoki's, I like the heel better. have to go with the Chloe boots! Great find,Erika! I would buy the Yoki ones, just because they're in my price range, but I am dying over the Chloe ones because it doesn't have all of those gold accents. I hope you have a good Sunday. Although they're out of my price range, I definitely have to go for the Chloe pair. They're amazing! i'd have to go for the chloe ones, they are divine! I love the Chloe boots! Honestly, I think the cheaper one might be more street worthy. I like the grip on the sole. These boots are not totally my style, but between the two I think I prefer the Chloe ones. Great finds!!!! Love! And great blog; happy I found you! I need boots for this winter! And these are so stylish darling! thanks for the B-day wishes and hope you're having a great weekend!!! enjoy!!!! No way could I afford the real deal. I love the cheaper ones. I love the gold on the cheeaper pair! I like the lines on the Chloe ones, the Yoki is good for its price but it does not look tough enough maybe for not having as much structure as the Chloe's. super cute boots. love them both! The Chloe boots are amazing! This time i will prefer the Chloe boots ! i mean, they are better wraped and the material looks posher, but the Yoki ones are great,too! love your posts, sweetie! The Yoki ones are made for people like me. I mean, I love the Chloe ones. But I also love not being in debt. Besides, gold accents are kind of cool, no? The Chloe ones are absolutely gorgeous, but Yoki's a bit more realistic. I don't really like the sole on the Yoki's though. 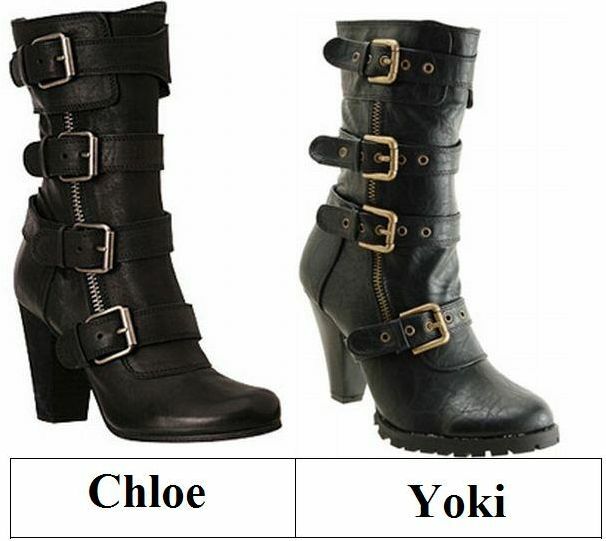 I love buckled boots like these ... both are fabulous but if I could have any pair, I'd go with Chloe! That might be my only way to have anything close to a Chloe boot. Why does cold weather attire always seem like its sooo much more expensive than warm weather attire? Love the Chloe boots but no way could I spend that much on a pair of shoes! I love this type of style, but I am too scared to pull it off! I actually like the knock off better! Amazing how you find these. They are so alike. The Chloe boots are my fave!! Boots are my favourite part of the Autumn. I'm so excited to be wearing them. I love the style of both, but definitely prefer the Yoki ones. It costs an arm and a leg but i just love the Chloe boots! So fab. Thanks for sharing Erica dear. What I'd really like from Chloé this season are their yummy caramel-colored pants, knits, belts... all chewy and milk coffee delish. love love love these so much...both pairs! As I was looking at the side by side pictures I was thinking "I see the similarity but I just love the simple silver buckles of the Chloe boot". Then I read on and I adore the fact that your eye was discerning enough to immediately call attention that fact. OH dear, I have to say I like the Chloe ones better! The straps are too awesome! I think the Yoki ones look a little bit more military with the color tone of the buckles, and I like that they are not quite as chunky. The Chloe ones remind me more of motorcycle boots. So I will go with Yoki. Love this tough look- the Chloe is my fave though. I like the silver. Happy Monday! The Chloes stole my heart! I'm going to have to go with sassy spendthrift on this one! I am sassy today because I prefer the silver details on the more costly boot! so at first glance those are not my type...but....i think maybe i really like them! I prefer the Yoki. If you live where it snows the grip on the Yoki is the way to go.